Whether you're heading out of the country or out of town to be one with nature, your DSLR camera, 3-5 lenses, laptop, and more will be secure in this black S-Series Backpack Travel Bag from Vinta. A dedicated laptop slot holds up to a 15" laptop if inserted into the bag from the top, or a 13" laptop if inserted into the bag through the back of the bag. A zippered field pack is included with the backpack as are multiple padded, touch-fastening interior dividers which protect all of your camera gear while you concentrate on getting the perfect shot. A front exterior organizer pocket features separate slots to hold slim and small accessories like film, memory cards, notebooks, smartphones. Dual side slip pockets offer another storage opportunity for pocket sized umbrellas or small water bottles. Comfortably carry your gear around by way of the leather wrapped top carrying handle or utilizing the adjustable backpack straps. Waterproof material helps prevent inclement weather from forcing you indoors while the leather details offer a touch of style. Box Dimensions (LxWxH) 16.9 x 12.8 x 6.7"
S-Series Backpack Travel Bag (Black) is rated 4.7 out of 5 by 23. Rated 5 out of 5 by Anonymous from Great bag I took this bag with me on a 10 day trip to Iceland and it worked perfectly. I fit my full size DSLR, two lenses and my reversible tripod inside plus a rain coat, wallet and snacks. Not only does it look great, it is really easy to pack and unpack. I love the dual openings, and the small insert bag. I got many compliments on it as well. I like that it does not look like a camera bag, and that I can remove the padded inserts to fit more everyday items if need be! Even with all of the added weight of camera gear it was still very comfortable to carry. It stood up to the Icelandic rain as well. I am very happy with my purchase! Rated 5 out of 5 by Adam Michaels from Perfect size for shooting on the go! I've used this backpack on 3 weddings, 5 engagements, and a trip in Europe, and I have been more than happy with it. It is smaller than I assumed, which is a good thing! I fit inside my 5dMark3 with 24-70 2.8 attached, 70-200 IS V2, and a backup 6D Body. There are pouches to hold money, extra batteries, memory cards, business cards, ect. I also normally put a 600exrt flash inside as well. On my current trip through Europe, I was in Paris today and got drenched! But the bag stayed dry and all my gear inside was fine. I have been walking over 13,000 steps a day with this bag, and while my back does hurt a bit, I believe it is more from all the walking, and not from the bag. Can't wait for the Leather Tripod Straps to be released! Rated 2 out of 5 by Martin from Looks are Deceiving Although this backpack looks great, its functionality and comfort lacks tremendously.? I've had it for a year and taken it on local photo shoots along with testing it on an overseas trip. The padding on the straps are very thin, and I'm a fairly petite guy (5'5 athletic build). I understand this backpack was not meant to hold an entire arsenal of gear to shoot an entire event, but for its price range, you'd expect it to do more. Pros: - Looks Great - Fits 70-200mm, 85mm, 35mm, and 5D Mark III snugly. - Small travel pouch that you can put extra accessories in. - Makes you really think about what you need on a shoot before packing. Cons: - Not enough space, really compact and small. - 15in laptop fits, but with a little force. (13in fits perfectly) - Not enough support for your shoulders. (Would have sore shoulders after 8 hour days covering events) - Leather detailing has started to fray and coming apart. (Feels cheap to be honest) - Attachment straps are sold separately and made cheaply/extremely thin. Bottom line, it serves it purpose aesthetically, but for its price, I don't think its worth it. Rated 5 out of 5 by Anonymous from My go-to bag I initially selected this bag because I am a photographer and wanted something with a beautiful design but also weatherproof. After I received the bag I found that I loved it so much I started using it in place of all of my other bags. With the removable inserts I can pack all of my photo gear for shooting a wedding or take them out and use this as a travel bag for family excursions! Rated 5 out of 5 by KDphoto from Really good looking camera bag! Love the design and size of this bag. Fits a full size camera body and 4 lens + laptop and accessories. Two ways to open the bag. Well padded straps and back for comfort. Best thing it doesn't look like a camera backpack, very well designed, I expect this bag to last for years to come. Rated 3 out of 5 by Brian M. from A Good-looking but Mediocre Bag This bag was definitely hyped up but what led me to purchase this bag was merely the looks and the fact that it can carry a laptop and camera stuff. For the quality, it was mediocre. Other than the leather details (which only add to the looks), it is a pretty ordinary bag. A few things that bothered me was how thin/flimsy the leather straps w/ the buckle were, the padding for the back feels like one of those cheap stuffed animals that you can win at an amusement park (it is a stiff styrofoam that makes rustling noises), and my usual petpeeve: a couple loose threads. 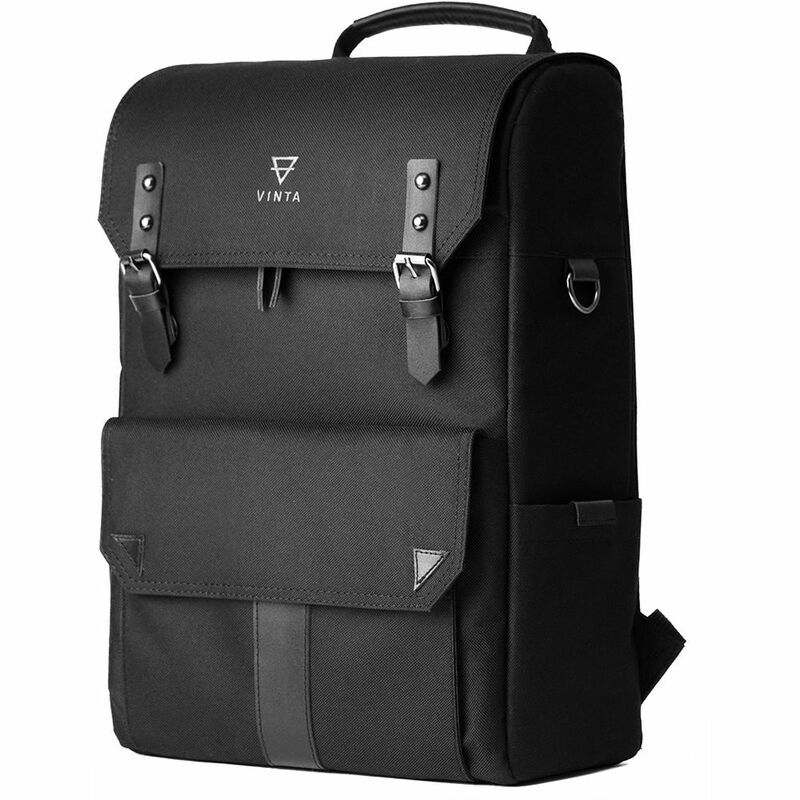 I gave it a generous 3 stars because it looks pretty darn good, quality is mediocre, and it gave me the convenience of carrying my laptop and camera stuff all at once which is good for someone that travels via plane frequently. At this price point, I would've expected more leather and less loose threads. This bag is also not very comfortable to wear because of the stiff backpadding. I cannot comment on durability yet but it is quite predictable because I've had similar bags before. The net layer of the back padding seems like something that is easily tearable if you accidentally brushed it against something sharp. The threads popping out will sooner or later depreciate the aesthetics of the bag. In fact, the triangle leather detail's threads are already coming out.. I would only recommend this to someone who has the money to blow and had the same reason as I did to buy it. Rated 5 out of 5 by Anonymous from Coolest camera bag This bag is great! I was looking for a backpack but what I seemed to find was either too large, not waterproof, etc. My 6'2 husband can wear this comfortably, and it fits my 5'2 frame as well without it looking massive. I love that there are loops on the bottom so you can attach a tripod (they are almost seamless, lay flat, and just big enough to fit the straps or ties through). I've taken it on a hike already with my Canon 5D Mark III, one lens, accessories, with plenty of room to spare for extra lenses or a light sweater. Camera/gear access is on the back, and can only be accessed when the bag is off which I'm sure can be bothersome to some, but i like that it keeps my gear safe. On the inside, the Velcro dividers can be customized to fit your configuration. The field bag can be accessed through the top via a zipper, and that's plenty secure for my phone/wallet/extra accessories. Overall, it's a handy bag to have, and I especially like that it doesn't look like a camera bag. What are the internal measurements of this travel bag? Vinta states the internal dimensions of the Vinta S-Series Backpack Travel Bag (Black) are 11 x 5 x 15.25 . Is this item eligible for international return policy? This bag is eligible for a return or exchange within 30 days of the original purchase date along with its original packaging. What size laptop can the bag hold? My 15 Macbook Pro fits like a glove. Can the interior dividers be configured so that you can fit a camera with the lens attached to it? Because as I can see so far, there aren't any L-Shaped velcro pieces. It would rather be inconvenient to have to remove the lens every time I have to put the camera back. There are no L-Shaped velcro pieces. You can remove some of the smaller dividers and make a large rectangular space but this does mean your camera can move around slightly and wastes a bit of space.Alternatively as this is velcro based I've salvaged L-shaped dividers from an older bag I had. Can I fit a small water bottle in the exterior side pockets? No. But you can take a small water bottle inside thetop compartment for example or make some DIY device attached to your bottle and hang it on one of the sidesof the bag. Does the zipper around the front opening flap have a place to attach a security lock to secure the zipper from opening? If not, I would need to be careful that someone could access the bag and steal something from inside rather than steal the whole bag. The zipper is on the side of the backpack that rests against your back, therefore when you are wearing it there is no need for locks. Long with the top flap there are 2 extra zipper pockets to go through so taking anything from the bag while it is on you would be difficult. What are the dimensions of dedicated laptop slot? I am curious to know if a new 15 Macbook Pro and a 12.9 iPad Pro with Smart Keyboard would fit in that slot together. It fits my macbook pro 13in with some room. I don't have an Ipad. But did slide a book thats same thickness of my macbook and 12in to test for you. It's pretty stretchy, like some sort of neoprene and think it would fit yours though it may be tight and would depend on if you have cases on both of them. Hope this helps. Can this fit a Canon 5D Mark III with a battery grip on it? Yes it can. It comes with dividers that have a strong Velcro that you can move around and adjust to fit however you'd like.